Telly Talk Bingo hit our computer screens in December 2013 and with a name that combines two of our favourite hobbies we were excited to see exactly what they had to offer. The site is powered by the popular 888/Globalcom software which is always a good sign, but unfortunately they have opted for the Cashcade network, which in the past has proved to be lacking in certain key areas. Nevertheless we are not going to make any assumptions as we like to judge each site on it’s merits. First impressions are very good, as even though they have used the networks standard layout, you can see that they have made a real effort to stand out. The blue and purple colour scheme of Telly Talk Bingo is attractive and sure to appeal to both male and female players alike and it makes a real change from the pastel palettes we see all too often. The logo is cute and consists of a row of four houses and a tagline saying ‘Where bingo lovers talk telly!’ so from the off we know exactly what they are trying to achieve and it’s a very good idea if they can pull it off. First impressions are very good, as even though they have used the networks standard layout, you can see that they have made a real effort to stand out. The blue and purple colour scheme is attractive and sure to appeal to both male and female players alike and it makes a real change from the pastel palettes we see all too often. The logo is cute and consists of a row of four houses and a tagline saying ‘Where bingo lovers talk telly!’ so from the off we know exactly what they are trying to achieve and it’s a very good idea if they can pull it off. When you come to register you will be asked to complete a small form where you have to enter the usual details such as name, date of birth and email address etc. If you have accounts with any of the other sites on the Cashcade network, you will need to come up with a different username but this is not really much of a problem. You are asked to enter your credit card details but this is just for security and ID purposes and no money will be taken until you want to play for real. Telly Talk Bingo will welcome you with a free no deposit bonus so you can get a feel for place without risking any of your own hard earned cash. Head into the lobby and the blue and purple colour scheme continues. This may seem like a small detail to mention, but so many of the other sites on the network don’t bother doing this and don’t even have their logo on show; This just adds to the feeling that Telly Talk Bingo are trying really hard to offer something different. In addition to the usual four tabs offering 75 ball bingo, 90 ball bingo, pre-buys and instants, you will find a an extra Telly Talk tab which contains two rooms that are exclusive to the brand, where you can play without having to compete with players from dozens of other sites. Head into any of the Telly Talk Bingo rooms and you will receive a warm welcome from the CM, who will also give you details of any chat games that may be running. The rooms are well designed with large areas dedicated to your cards and having a bit of banter with your bingo buddies. There are plenty of options built in, including a handy auto-buy feature that you can set up to purchase and play your cards for you if you need to step away from the computer. From within the rooms, you can also access a selection of mini games and these are really useful for filling in the time whilst you are waiting for the next bingo game to start. The promotions are what usually let the Cashcade network down, as in our humble opinion they just do not offer enough for the modern online bingo player. With so many other networks out there, and many of them powered by the same software, all offering a wider variety of promotions, Cashcade and their partners really need to take a look at their line-up to see how they can improve things. It’s not all bad though as there is still £50,000 worth of guaranteed cash jackpots up for grabs every week and for a lot of players, the chance to win big cash prizes is their sole reason for playing. Telly Talk Bingo is not a bad site at all and it’s good to see they are trying hard to be the best on their network. The idea behind the brand is sound, but we can’t help but feel they could have taken it further as apart from the name and the tagline, there is no real connection with television at all. However, we need to remember that at the time of writing, this site is less then a month old and they are already putting more established brands to shame. For now we are going to reserve judgment, as all signs seem to point to the fact that they are going to continue to offer that little bit extra, so we will be keeping a close eye on them in the future. 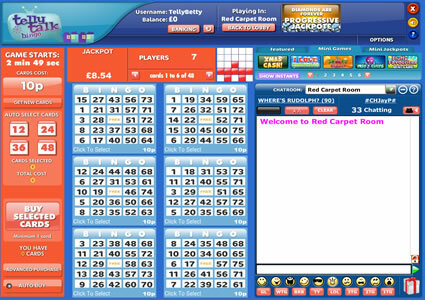 Telly Talk Bingo is one of the many sites powered by the 888/Globalcom software, so the quality of the gaming is assured. The software has been around for many years and has been honed to perfection across a number of different brands to make sure everything works flawlessly. The software brings with it a great range of games and in addition to 75 ball and 90 ball bingo, you will find an impressive selection of side games including multi-line slots, scratch cards, Roulette, 3 reel slots and instants. All of these side games open up in a new window, so do not interfere with your bingo fun in any way. The bingo rooms are well designed with a number of different options, allowing you to customise the game play to suit your own tastes. These options are broken down into five categories; General, In Game, Chat, Card Prize Alert and Dabbing Configuration, which includes a number of different dauber shapes and colours. In the chat room you can alter the size and colour of your font and make full use of a range of emoticons and pre-programmed bingo acronyms to save a lot of repetitive typing. You also have the ability to send your friends virtual gifts which is a really nice touch. 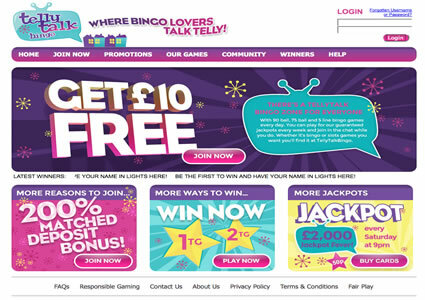 Telly Talk Bingo is part of the Cashcade network and they give away over £50,000 a week in guaranteed cash jackpots. They are given away through special games that run every fifteen minutes in both their 75 and 90 ball bingo rooms, so it does not matter which game you prefer, you can still join in the fun. 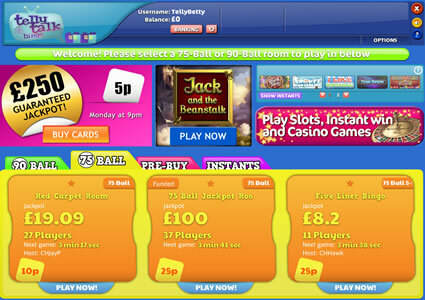 The jackpots in these games range between £25 and £250, depending on the time of the day you are playing. If you are looking for larger prize pots though, make sure you check out the ‘Pre-Buy’ tab in the lobby. 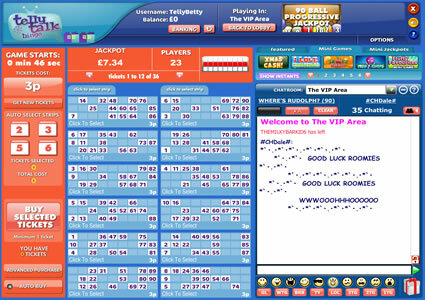 In here you will find details of Telly Talk Bingo’s nightly 9pm specials, where from as little as 5p a ticket you can win even larger prize pots. The Cashcade network is unfortunately not one of the best when it comes to promotions. If you like picking up a lot of free bonus money every time you make a deposit, or the lure of guaranteed cash jackpots gets your pulses racing then you will no doubt have a great time. Chat Games, a Loyalty Scheme and a Refer a Friend Bonus are all well and good, but with so much competition out there, new sites really need to up their game to be in with a hope of surviving. Not all is lost though, because Telly Talk Bingo are showing signs of doing something a little bit extra to make themselves stand out from the rest of the network. Head into the lobby and you will find an additional ‘Telly Talk Bingo’ tab containing two rooms that are exclusive to their players, increasing the odds of you winning a game or two. This may just be a small addition but at least it shows the brand are willing to try something new, and we need to remember that at the time of writing this review they are still a new brand, so they have plenty of time to continue this trend in the future. Telly Talk Bingo like to reward their players for continued loyalty. In addition to their regular guaranteed jackpot games, they also reward you for playing with Bingo Points which you can exchange for free bingo cards. You will start earning these Bingo Points from the moment you register for an account and you can keep track of how many you accumulated by logging in and heading to your ‘My Account’ page. There are a number of different ways to earn Bingo Points, with the easiest one being simply playing your favourite games. Telly Talk Bingo will reward you with one Bingo Point for every 10p you wager on bingo cards, regardless of whether this is in the 75 or 90 ball room. You can boost your tally by taking part in the Chat Games run by the CM’s and they are always happy to let you know what game is running and how you join in the fun. Finally, if you like what you see, make sure you tell your friends about Telly Talk Bingo, because each one that registers and makes a deposit will earn you 5,000 Bingo Points worth £5.